Here’s Why You Should Choose This Sandhurst Wood Cabin for Your Family. This Trentan garden log cabin with its optional Georgian look, feature glazed double doors and airy windows is a great looking building – and is available in four different sizes. The front roof overhang provides a degree of shelter from the sun and rain whilst you enjoy this lovely building. The many uses for this log cabin range from recreational, to fitness activities, to entertaining or for a home office or craft room. And countless other uses. This large log cabin lends itself for sharing with your family which has to be a good thing in this modern age. Just do a little brainstorming and you will be surprised by its uses. One of the keys to a top quality garden cabin is in the quality of wood used and this is where we can learn from the expertise of the Swedes. 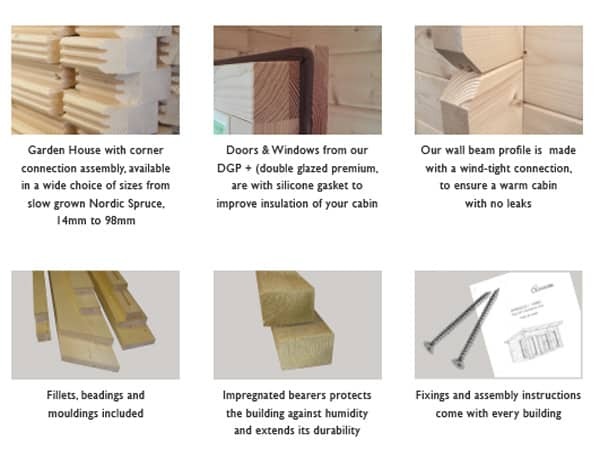 They have known for years that Nordic slow growing timber is ideal for outdoor buildings. This is because the timber grows very slowly ensuring that the grain in the wood is tightly compacted. This helps to make it more stable in the varying British weather and the number one choice for these Trentan ‘Hungerford’ wooden cabins. As important this timber only come from sustainable sources and is properly kiln dried. Being soundly built with Nordic timber and made in a controlled environment is very important. The construction of the doors and windows, which are upgraded to DGP+, play a great part in a log cabin so it’s vital they can match up to the sturdiness of the timber used. And you will find that these doors and windows will deliver in ‘spades’. Specially designed and laminated in parts of the doors and windows this gives unrivalled strength. This resists the natural movement of the timber. Combined with adjustable hinges (not cheap Chinese ones) and weather sills they can face everything the UK weather throws at them. Peace of mind is supplied standard – very reassuring! These log buildings with their modular design make them very easy as well as straight forward to build although this can be hard work. Having said that it can be very rewarding. These cabins were initially pre-assembled in the factory to ensure the minimum of problems out ‘in the field’. They are then flat packed before being delivered to the customer. However, not everyone wants to assemble their own cabin so we can arrange a log cabin installation service for you. This is not excessively expensive for the amount of work involved and does provide peace of mind and also provide an absence of aching bones. Worth considering as an option. We can also arrange other essential services for you as well. With many luxury large garden cabins to buy and available on the ‘web’ it’s easy to be persuaded by the flashiest web site or possibly the glossiest brochure. However, you need to stop and think before buying. How can you be sure it’s what you think it is? The ONLY way is to view beforehand and this means taking the trouble to visit a display centre. We have such garden buildings display areas near Guildford and Farnham in Surrey where you can examine samples of our garden cabins. You might not be able to see the ‘Hungerford’ log cabin but will be able to see examples of the Trentan log cabin family. This will be able to show you the attention to detail and the general quality of this range of log cabins. These Trentan ‘Sandhurst’ buildings are available in the standard size and layout as well as other sizes. However, they can also be made in bespoke layouts as well as in different sizes ensuring they can meet your requirements. This customisation adds to the cost of the cabin and delivery time but it does ensure you get a building to suit your needs and requirement, well worth considering. You can also be sure that 1st Choice Leisure Buildings, a family business which started in 1979 understands the need to make log cabins to a standard and not DOWN to a price. Our Ethos is to ensure quality reigns over cheapness and to date has been the right policy. Great Eaves Height 2.05m. Overall Height 2.6 to 2.8m. Size: Four sizes of the Sandhurst log cabin are available. 3.0 x 3.6m, 3.6 x 3.6, 4.5 x 3.6m and 5.1 x 3.9m. Apex or gable style cabin. Note this is the external size of the body of the cabin. The lugs extend 100mm on each corner making the overall size (as most other companies quote) 200m larger. We mention this so you know you are comparing ‘eggs with eggs’. Approximate clear internal size will be approx 2.9 x 3.5m, 3.5 x 3.5, 4.4 x 3.5m and 5.0 x 3.8m respectively. Please check with us if internal size is crucial. Cladding: The logs are cut from a top grade of Nordic Timber and this ensures the maximum stability and longevity of the timber. Standard logs are 44mm thick and interlock into each other. The log profile has designed wind-tight connections to ensure a superior resistance against wind. Untreated. Kiln dried timber from sustainable sources. Doors: Joinery quality double glazed (3-9-3mm) double doors 151cm wide x 186cm high – approx sizes. Postion of doors in different place in different models. Easy adjust hinges complete with gasket seals, fitted silver finish door handles, cylinder lock and two unique keys. Low doors sills giving you easier access into your log cabin. Supplied untreated. Beware of doors with single glazing or excessively high door sills. 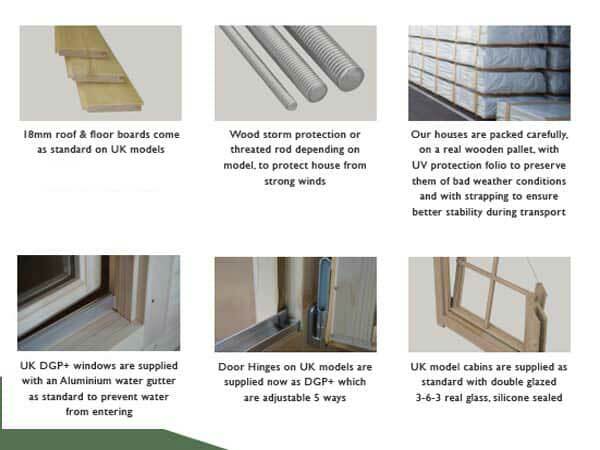 Windows: Joinery quality inward double opening windows included as standard. Size of windows on 3.0 x 3.6, 4.5 x 3.6m and 5.1 x 3.9m models are 117cm x 87cm. On model 3.6 x 3.6m it comes with a single window 76cm x 87cm. Complete with easy adjust hinges, silicon gasket seals and delightful silver finish window handles. Supplied untreated as standard. Double glazed (3-9-3mm) as standard NOT single glazed. Georgian window bars included free as standard. Roofs: 18mm thick T&G boards used on the roof sections supported by strong roof beams. Roof beams meet EN 388 stringent standards. Untreated. Supplied with felt tiles (shingles) in either red, brown or green or Polyester based felt as standard. Roof overhang on rear. On both side it extends by about 30cm. On the front it extends out by 150cm on the 3.6 x 3.6, 4.5 x 3.6m and 5.1 x 3.9m models. On the smaller model 3.0 x 3.6m it extends out by 70cm. Floors: 18mm thick T&G untreated boards used on these log cabin floors. No chipboard, OSB or other cheap sheet materials used on the floor, unlike some other log cabin UK suppliers. Strong floor joists and are normally spaced no more than 650mm apart. All floor joists are pressure treated for long life as standard. 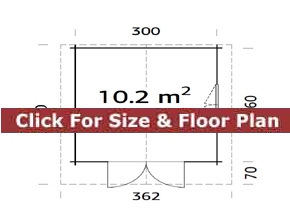 Lower Walls: Height is 2.05 – all Sandhurst garden cabins. Ridge Height: Height ranges from 2.63cm to 2.78cm. Treatment: All log cabins are supplied untreated. Assembly: These cabins are supplied in kit form for self erection. Option for fitting through a third party if required. If being built you would require a concrete base or solid and level paving slab base. Optionally, we have an option for building bases as well as many other essential services for you. These cabins are assembled by interlocking the panels for ease of taking it down again if you decide to move. Delivery: All buildings are delivered and HIABed off the lorry for you free of charge throughout central & Southern England. Deliveries to Scotland would cost £150 extra. Deliveries to Cornwall & Devon, South & West Wales and Northern England would cost an extra £100. The Sandhurst is a new log cabin in the Trentan range. Full details will be added in the next few weeks. In the mean time please contact us directly for up to date specifications.